The Funky Drum Shack offers drum lessons for absolute beginners to working professionals. My approach to teaching is designed to cover all styles of music and all aspects of playing. I can build on your playing confidence if you are already playing or give you a strong foundation if you're starting out. All lessons are individually tailored to each students needs and ability. If you have any questions please contact me via the enquiries form or by phone (07973 185901). "Eyes, Ears and Knowledge" - To develop the necessary reading and improvisational skills that the modern drummer requires. To study different musical genres and historical figures in the Percussive Arts. To learn how to practice the correct way and develop a strong technique. I write my own scheme of work and use "The Funky Drum Shack" tutor books (digital download now available). All aspects of drumming are covered and include grooves, fills, songs and rhythm workouts. I also use an extensive library of "Artist/Band minus drummer" play-a-longs. 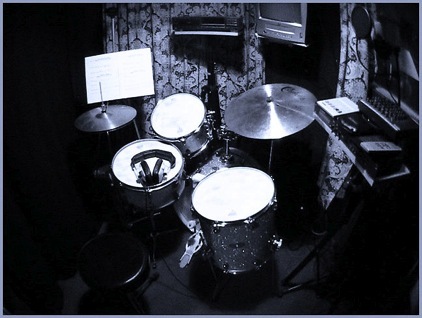 Yamaha 9000 Recording Series Drum Kit with Zildjian Cymbals. Roland TD9 KX Electric Drum Kit. A large multimedia projection screen. I use the Trinity Guildhall syllabus and currently have a 100% pass rate with a 94% Merit/Distinction. Sticks, ear plugs, tutor book, a USB pen drive (memory stick) and a pencil. Most importantly possess a good attitude and be open to learning the techniques that will make you a better drummer and musician.